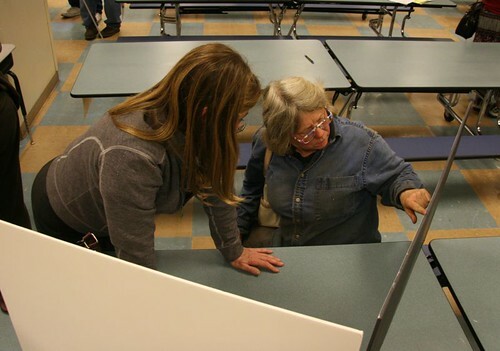 At an open house in Eastlake on Wednesday evening, concerns over a project to rebuild the intersection of Fairview Avenue North and Fairview Avenue East came down to two: parking and access for large trucks. 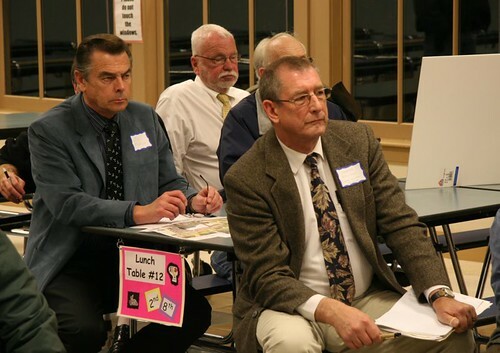 As staff from the Seattle Department of Transporatation went over details of three proposed alternatives, representatives of businesses in the area focused on how the project might impact weekday parking in the area. They said that there is already enormous pressure on parking spaces in the block of Fairview E. between Fairview North and E. Garfield and that they were concerned the proposed designs would only make matters worse. Fixing the intersection, which is notorious for speeding motorists and dicey pedestrian safety, has been an Eastlake community priority since the 1990s. 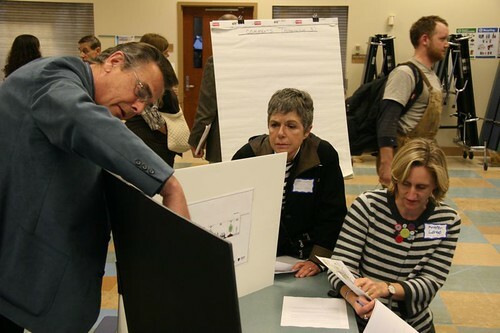 The project’s goals are to slow down motorists making high-speed turns onto Fairview E., make the intersection safer for pedestrians and bicyclists, preserve as much parking as possible, and complete the section of the Cheshiahud Loop trail that runs through the area. While no one disputed the need to improve safety and access, owners and employees at businesses in the area worried that proposed designs would eliminate too many parking spaces. One owner, Ben Howe of Ralli Round, a car repair shop, said that any loss of parking might spell the end of his business. George Neilson, president and COO of Lake Union Drydock, said that parking was also critical for his firm and the nine businesses who lease space at the drydock. “Parking is a huge deal,” he said, noting that none of the three alternatives presented by SDOT would work for the company. One problem was trying to identify how many spaces might be lost in each of the three alternatives. SDOT staff said they had been “very conservative” in counting how many spaces would be allowed under each alternative. Currently, employees park in tandem, packing every available space. That might not be allowed under the redesign. None of the three alternatives allow parking in the triangle of land next to the Washington State Employees Credit Union, something that is done now. “Hide and ride” bus commuters, people from other parts of the city and county, also put pressure on the area by parking there and taking transit into downtown. One speaker said she had seen homeless people living in their cars in the area. Another said he saw commuters drive up early, sleep in their cars for a while and then take transit into downtown. Given how SDOT is counting spaces in the alternatives, it was difficult to know how many spaces would actually be lost. Estimates ranged from as few as 10 to a high of 70. Tim Ahlers, Eastlake Community Council secretary and a member of the stakeholders group that has been working on the alternatives, suggested that the city try to count the maximum number of cars that could be jammed in under each alternative. That would at least allow everyone to get an accurate idea of what might be lost. Chris Leman, ECC president, said that a previous city engineer had committed to allowing the continuation of tandem parking in the area, a promise he feared was now being reneged on. Another concern was access for large trucks that bring material to the drydock. At 75 feet long, the trucks are even bigger than Metro buses. Would trucks be able to make the turn onto Fairview E., participants wondered? Would there be space for them to park and unload? 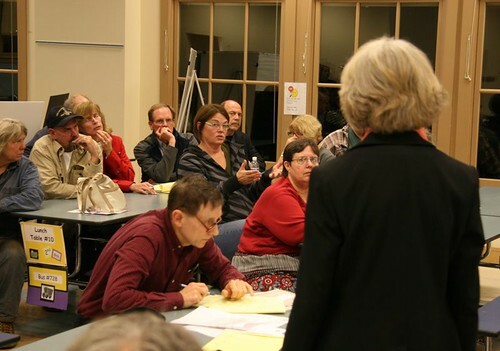 Business owners expressed concern that the designs might not have enough room. After discussing the merits of the three proposals for almost 90 minutes, one audience member offered a suggestion: What if you closed Fairview Avenue E. where it meets Fairview Avenue North? The idea drew thoughtful comments from several in the room and seemed like it might offer new options. George Neilson of Lake Union Drydock said after the meeting that vacating the intersection might work for his business. The main concern, he said, would be what the Seattle Fire Department thinks of the proposal. He noted that any time there is a fire call from the drydock, it gets a big response from SFD and the fire trucks usually arrive by turning off Fairview North onto Fairview East. Particpants in the open house were asked to fill out a survey asking them what their priorities for the project were. 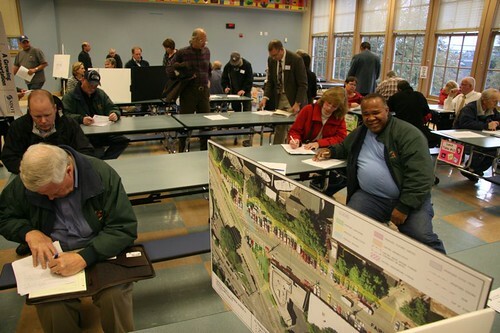 The survey will also be available on SDOT’s web page for the project. SDOT is hoping to collect the surveys within a week. The plan is to have the stakeholders’ group identify a perferred alternative in time for a second open house in January. For more information on the project, as well as plans for the three current options, go to SDOT’s website. This entry was posted in Uncategorized on October 27, 2010 by cdmilton. eliminating the intersection altogether is such a great idea. it would sort of turn the area into a big street end parking lot .. but that’s basically what it already is. pedestrians and cyclists could still get through. they don’t need nearly the same amount of space as cars, and already have their own “lane” coming off the bridge. just shunt that sheltered lane onto fairview N and keep the traffic on eastlake. smart stuff. Discontinuing the Fairview Ave North and Eastlake Avenue East motorized vehicle intersection offers up many very interesting oppotunities. We could try a temporary experiment. Garfield might develop a retail presence. This location could become a weekend/evening parking lot for recreational activities all along Southlake. Perhaps the parking could be accessed from Fairview North and the closure occur deeper up Fairview East? But why ponder possibilities? SDoT’s pre-ordained bicycle recreationalist alternatives will eventually prevail at the cost of scores of industrially-needed parking spaces. By pre-ordained are you referring to the fact that making this intersection SAFER has been a neighborhood priority since the 90′s?